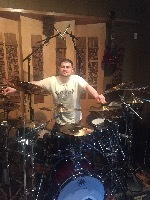 Alex Cohen has emerged as one of the top up-and-coming New York City drummers, having worked with artists ranging from Mac Miller to Death Metal legends Malignancy. His resume also includes work with Trey Gunn, National Geographic, Pyrexia, Nader Sadek, Cognitive, Pyrrhon, Imperial Triumphant, and more. Alex is also a featured columnist and v-logger at Sick Drummer and Drumhead, as well as a prolific educator who's videos have reached over one million views on social media.